It’s hard to beat a week out in the piney woods, especially when you tote along a hammock. I’ll have to admit that often I look forward with glee to slipping into my hammock each night. It should come as no surprise that when planning for summer camp I chose to bring along a few hammocks instead of sleeping in the camp-provided canvas tents. For this trip report, I want to give a quick overview of our experience, the facilities, and the particulars of hammock camping at Camp Geronimo. We left for camp at 4:30 AM to make the early check-in time. There had been heavy monsoon rains the night before and low-hanging clouds still clung to the ground. The scene was surreal and spectacular. We drove through thick banks of fog and clouds passing through Ponderosa pine forests and amazing red rock cliffs. We worried about elk crossing the road as we drove down the two-lane highway to camp, but thankfully only passed by a few elk who hugged the side of the road. Everything was wet and humid—a distinct change from typical Arizona weather—but I welcomed the needed moisture. 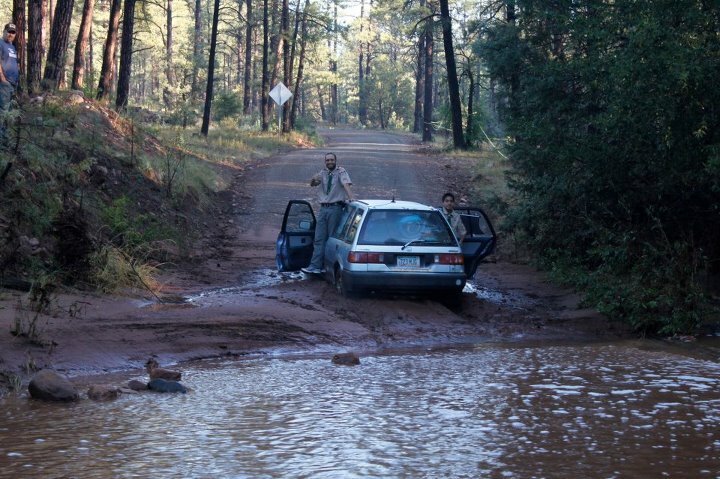 The foliage changed incrementally as we dropped off the Mogollon Rim and wound our way to the camp. The Ponderosa pine thinned out and in their place was a thicker undergrowth including juniper, Cottonwoods, Cypress, manzanita, and pinyon pine. As we turned the last corner and headed back toward Camp Geronimo, we came to our first crossing of the Webber Creek. The creek was visibly swelled and thick with sediment, but it appeared passable, despite the sign that warned, “do not cross when flooded.” The scouts in the car ahead of me throttled through only to get stuck in mud up to the axles on the other side. Thankfully they were able to shimmy back across the creek to safety. Two other trucks accompanied us to camp and they had 4-wheel drive, so we all piled into empty seat belts and made it past the mud bank, leaving the sedans parked on the side of the road. The road to camp follows the creek and in several places the road had been washed over with large rocks, logs, and other debris blocking our path. Thanks to skillful driving and high clearance, we made it safely to camp. 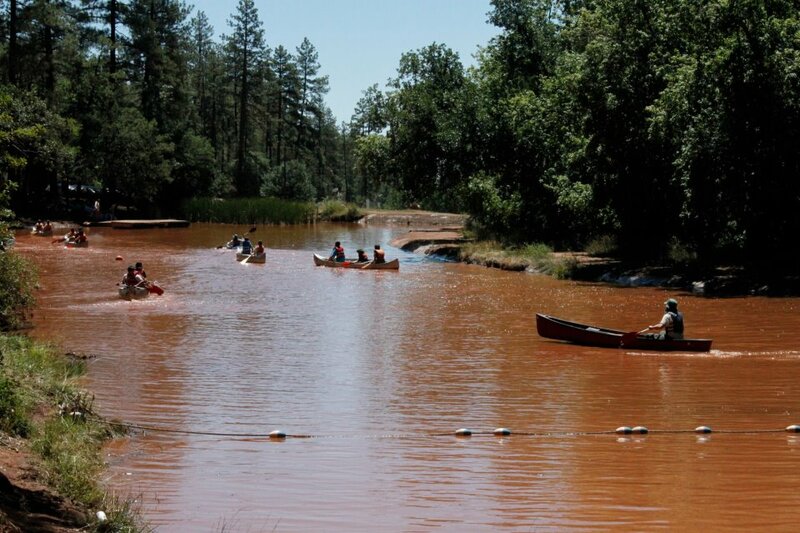 During our check-in, we heard that the camp received record rains that created a flood event. The dyke that diverted water to the camp pond had been washed out and other damage was visible as we carried our gear to our site (we couldn’t drive our gear because the camp road was impassable). 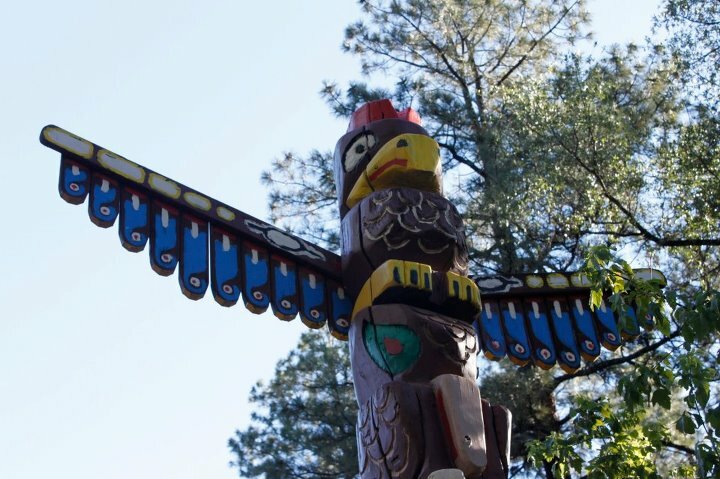 I had dreams of relaxing in camp and catching up on my reading or doing some whittling, but I was kept busy in Scoutmaster meetings, events, and following my scouts to their merit badge classes each day. 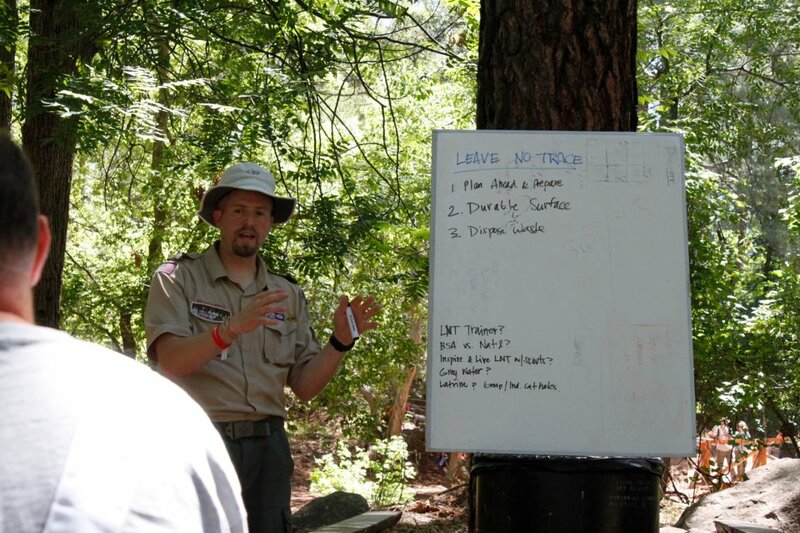 Mid-week, as I was talking with the camp program director about Leave No Trace (LNT), he asked me if I would consider teaching their adult LNT training class the following day as their instructor wouldn’t be able to make it. Although I didn’t really come prepared to teach an LNT course at camp, I agreed to put something together. Being an LNT Trainer, I felt confident in covering the topics, but I had to scrounge around camp to gather some visual aids. The Boy Scout motto is “Be Prepared” and this opportunity was a great reminder about any trip where you may find yourself in a trying situation: often good mental preparation will compensate for lack of gear and gadgets. Thankfully, the class turned out well. Overall, our troop had a blast at camp. Between merit badge classes, polar bear swims, tenderfoot runs, and campfire programs, we stayed quite busy. I was surprised to discover that each camp site at Geronimo has one or more “adirondack” shelters (3-sided buildings) that are reserved for the adult leaders. At some sites, these adirondacks are outfitted with bunk beds, shelving, patios, and windows. Our adirondack was more spartan, but it was still very functional; however, the adults opted for other accommodations and let a few of the scouts take the shelter. Our site also happened to be the furthest away from the camp and was situated at the highest point within the property. Huge boulders littered our area, giving the site a very rugged appearance. Since our site was on a slope, each platform tent was perched at different elevations, carefully balanced on rocks to remain level. It was a perfect site for hammocks, but it was a little precarious for the tents. A few scouts fought over the opportunity to borrow my Hennessy Hammock that we pitched inside the adirondack. I took my other hammock. the Woodsman X, as far back in our site as possible. The beauty of the Woodsman and Hennessy hammocks are that they feature integrated bug netting that makes hammock camping less of a hassle. I wasn’t expecting any biting bugs, but I was grateful for the netting when the flying beetles and moths came around at night, attracted by our lanterns and flashlights. 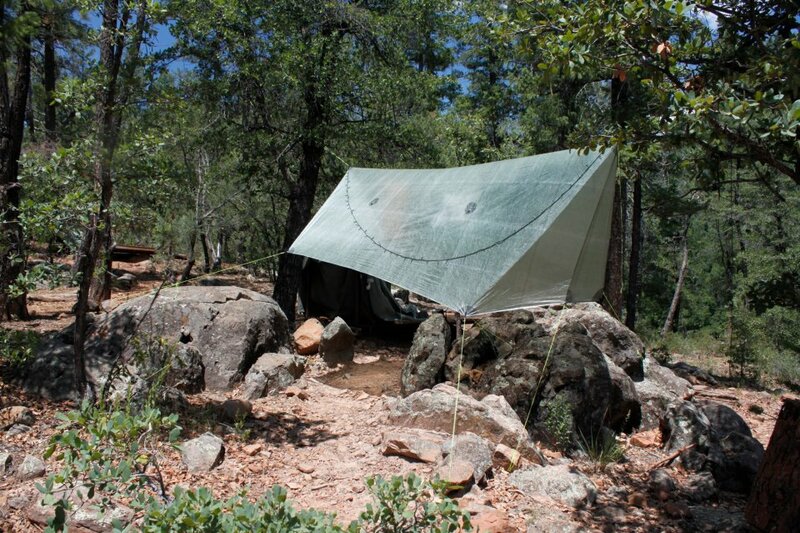 I pitched my hammock at different spots throughout the week, but settled on a rocky outcropping near the end of camp. Although I had my pick of trees, the rocks were too tempting from a hammock point of view. In order to hang over the rocks, I had a span of more than 20 ft. (6 m.) between the trees. A good distance between trees is typically 12 and 15 ft. (4 and 4.5 m.)—just far enough apart for a tarp to clear the anchors with room to tie-off. Too close and the tarp won’t fit; too far and you have to hang the straps out of arms reach. Not only did I have to pitch higher because of the distance between anchors, I also needed to clear the rocks. Thankfully my hammock had an internal ridge line that helped keep the appropriate sag in the hammock despite my less-than-optimal hang angle. 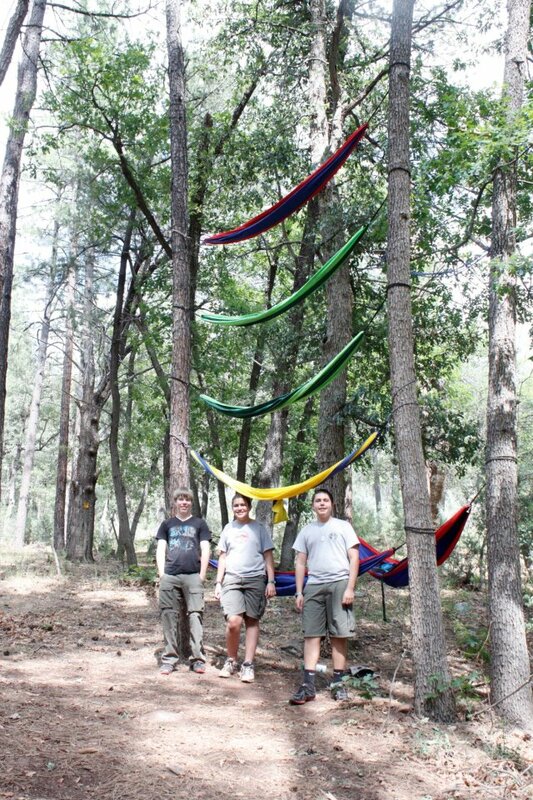 I gave a hammock presentation mid-week and learned that one troop had just started bringing hammocks to camp last year and was in the habit of stacking them. After the presentation, I hiked over to their site and took a photo of the spectacle. I spent some time to show the scouts how to properly hang and sleep in their hammocks. Their eyes lit up after laying in the diagonal, “This is so comfortable!” they kept exclaiming. It was amazing that for the past year they had been laying in the center line of the hammock. The other leader in my troop, who attended my hammock presentation, decided to give hammock camping a try, so I kicked the scouts out of my spare Hennessy hammock for the final two (rainy) days. I used my spare tarp—the Hennessy Cat Cape asym tarp—to cover the hammock (this tarp, coincidentally, doubles as a hoodless poncho with its integrated zipper and draw strings). Some people wonder if these minimal tarps really work in the rain. 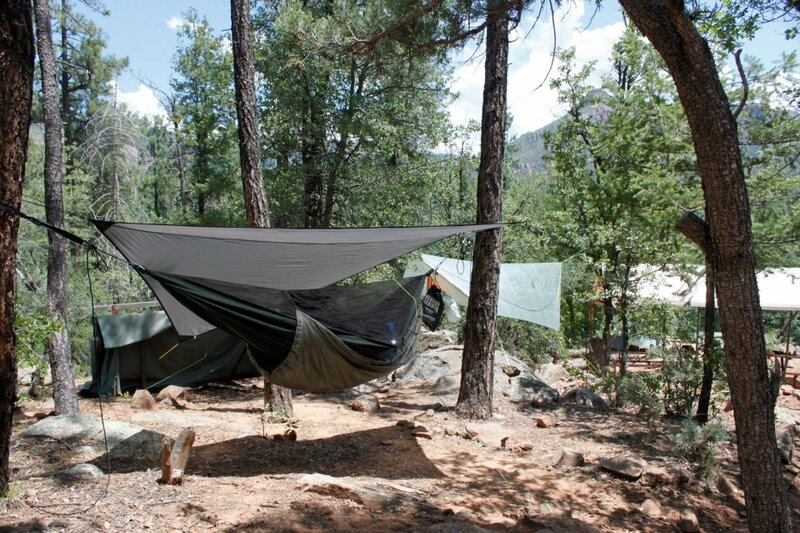 The trick with a small, asym tarp is to pitch it as close to the hammock as possible. My fellow Scouter slept dry and comfortable in spite of all the rain in the night. I should also mention that when the rains came on Friday, most of the platform tents the scouts were sleeping in got flooded out, so we had eight of our 12 scouts crammed into the adirondack Friday night. 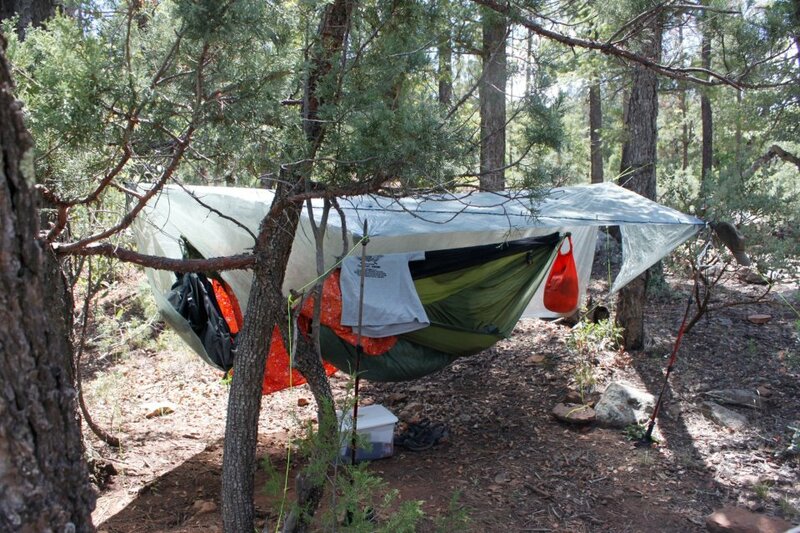 We had one other spare hammock—a simple, gathered-end hammock—that we hung in the rafters of the shelter. Another leader who came up Friday to help us drive the scouts home, had borrowed a hammock kit from me and also slept in comfort in the night. He used my Hammock Bliss No-see-um No More mosquito hammock and my Arrowhead Equipment KAQ under quilt. This is a great camp that I went to as a boy. Thanks for sharing! 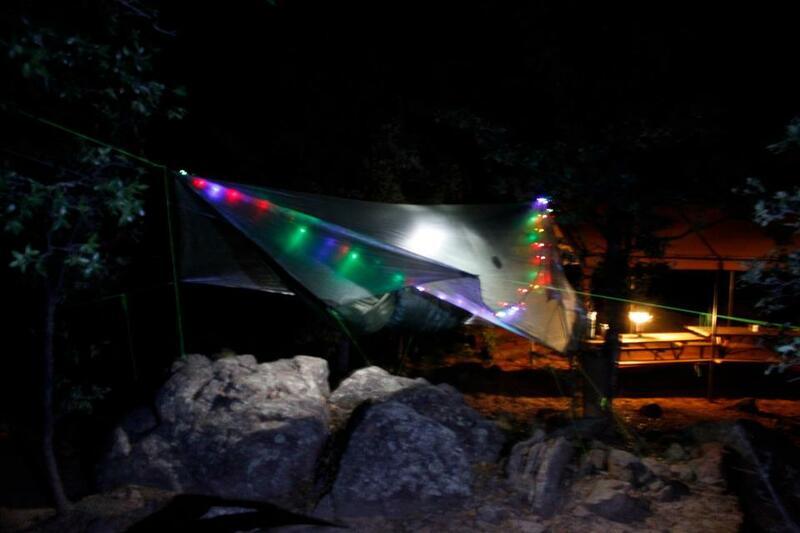 What did you use for your tarp guyline in that last photo? It absolutely glows! Oh that’s just fluorescent braided mason line! Cheap!